MY SISTER MARY WAS A 1966 GRADUATE OF THOMAS W HARVEY HIGH SCHOOL AND IS A MEMBER OF THAT SCHOOL'S DISTINGUISHED GRADUATE HALL OF FAME. DURING A DISTINGUISHED NAVY CAREER, SHE WAS A TRAIL BLAZER FOR WOMEN IN THE U.S. NAVY. She enlisted in the U.S. Navy in 1976 as an E-3 Seaman. *Early on, she was chosen as a model for Navy posters, and also represented the Navy in Public Relations projects. *1991-93-She served as Senior Enlisted Member on the U.S.S. Ainsworth; and she estified before a panel of the Presidential Commission for Women in Combat. 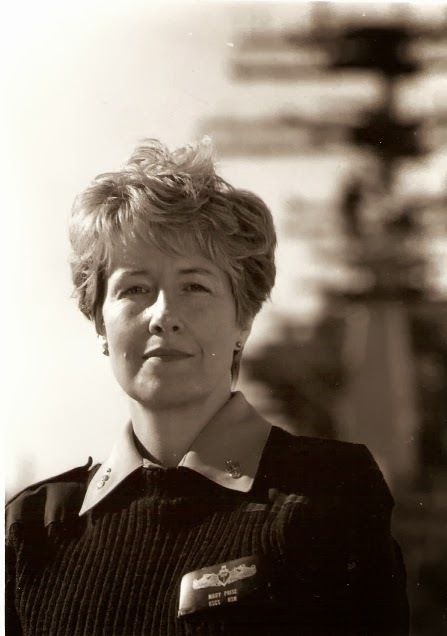 *1987-89-She was the first woman Chief Petty Officer to serve as Assistant Officer in charge of a military detachment of twenty on board a U.S.N.S. Merchant Marine Ship. She was responsible for all communications for the ship.